On 24 July 2012 Dr Michael Kambeck, EuFoA Secretary General, gave an interview to Tert.am. He shared his views on the Karabakh elections, the settlement of the Nagorno-Karabakh conflict as well as the up-coming EU donor conference for Armenia. Please, find below the interview. Michael Kambeck, European Friends of Armenia (EuFoA) organization Secretary General, is in Armenia during these days. July 18-21 he was in Nagorno Karabakh to observe the presidential elections. Tert.am held an interview with Kambeck, who spoke about the Karabakh polls, negotiations over the NK conflict settlement as well as causes of postponement of EU donor conference scheduled to take place in Armenia. – Authorities in Nagorno Karabakh, as well as in Armenia, view democratic elections in NK as a step forward towards NK’s international recognition while EU High Representative for Foreign Affairs Catherine Ashton said recently that presidential elections in NK must not result in any change in NK’s status. How would you comment on this? – The EU and the OSCE have both no longer ‘condemned’ the elections, as they have sometimes done in the past. Everybody today understands that in order to solve the Nagorno-Karabakh conflict we need more democracy, not less. Only this will prepare the societies for peace. The good elections in Karabakh increased the pressure on Azerbaijan to improve also their democracy and to stop threatening the democratic breakaway region with war. 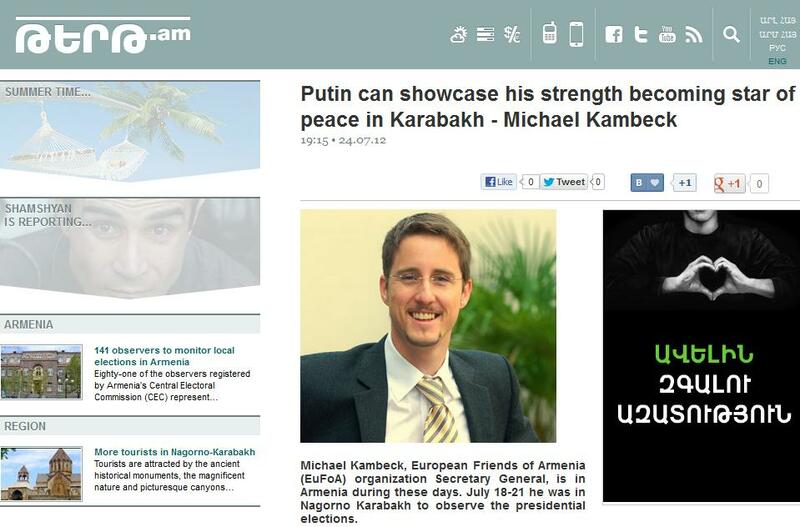 – Who else could be involved in Karabakh talks any time in the future should the conflict not be resolved? – The problem of solving the conflict is not stuck because of the mediators or the OSCE Minsk Group format, it is stuck because of the conflict parties, mainly Azerbaijan. Therefore, no change will make sense and nobody who really wants to solve the conflict wants to burn their fingers and get newly involved. But I can imagine that the US or France may start making new initiatives within the Minsk Group, such as the series of talks initiated by the Russian President Medvedev. Maybe, if Russia wants to keep this in its own hands, we will also see a new initiative by Vladimir Putin. He could use and showcase his strength and become a star of peace, before the Sochi games. – What is your vision of the settlement of the Karabakh conflict? – The Kazan meeting had a very balanced text which was very difficult for both sides. Any peaceful solution will be very close to that, and without the last-minute amendments of President Aliyev, the first wave of IDPs would now move back into Aghdam, while Karabakh would have an interim status and international security guarantees and peacekeepers, amongst other measures. If Aliyev really cannot imagine any solution very close to that compromise, the conflict will follow an irrational path, including war and bombs on Baku and Yerevan. But I believe that the oil-rich circles in Baku will pull the break and replace him, before he becomes even more like Gaddafi or Assad. They will not want to risk their wealth. – There have been various speculations on the date of the organization of the EU-backed donor conference in Armenia. You have declared about the probability of holding it after presidential elections in Armenia in 2013. What are the main processes that can change that date? – The date is not so relevant. What use is a conference which is organized in haste and then will bring a weak result? It is more important for Armenia that all international partners will have excellent and credible documents and that they have enough time to prepare. This is possible until around November, but I think that most participants will say that this is too close to the Presidential Elections. – What significance may a donor conference in Armenia have in addition to financial assistance? – It is an international recognition of the maturing state of the Republic of Armenia. It will also be a signal that this country is moving dynamically and has a strong will to not only talk but actually implement. – Other than logistics, what else should Armenia do to host the donor conference? – Above all, there must be no Greek-style dream figures. The EU is now hyper-allergic to falsified or unrealistic statistics and financial plans and they will verify this intensively. The better the prepared documents will be, the faster will be this process of verification and the higher will be the willingness to donate. The Prime Minster, as ex-chief of the Central Bank, has a better reputation than his South-European counterparts and this could help. Subscribe to our news roundup to get news on your email. All rights reserved EuFoA 2019.